All my chores were done except closing up the chicken pen and I was sitting watching television. It wasn’t quite dark enough to close it up without having to round up the last few adventurous chickens. I heard the words, “Go out to the chicken coop.” I knew it was too early for my normal routine, but thought maybe the words indicated a need to get a few more eggs. As I approached the coop I heard loud clucking noises. Every hen was loudly expressing her unhappiness. Walking from the gate to the coop I heard a swoosh … swoosh, but couldn’t place it. I opened the door and looked inside and all the hens were smashed against the back wall in an effort to get as far from the little entry door as possible. Something was wrong. I closed the pen, walked up the little hill to turn on the lights at the back of the garage. From there I could see a large bird in the pen, hanging from the end wall where the top netting joined the wire wall. At first I thought it was a hawk but as I entered the pen I realized it was a Great Horned Owl. It was beautiful. Danger ne ver entered my mind. I was fascinated and present to the moment. This magnificent being was inside the pen and didn’t seem to know its way out. I walked closer, standing a foot or so from the owl and began talking to it, connecting, remembering the oneness that is everything, myself and the owl included. There was nothing to fear. Gently I explained the owls predicament and began coaxing it down from the railing. It dropped to the floor of the pen and headed into a dead-end, only to fly back up to the railing, extended it claws and grasp the ledge tight. It was clear the owl needed my help to find its freedom. Words came out of my mouth, words of companionship, words of safety and compassion. We looked into each other’s eyes, his so big and yellow, mine much smaller brown orbs, and drank deeply from the well of our oneness. When the time came I closed the one step separating us and placed my hands over the bird’s wings, holding them against its warm body. Standing behind it I gently pulled and asked the Great Owl to release its hold, to trust me to help it. 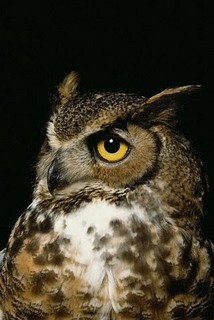 A couple of heart beats passed and I watched the owl’s talons open. For minutes I stood in awe at this owl and human, connected, at One. The Great Owl did not hoot, did not struggle. He relaxed into the hold, meeting my adoration with his. I could have stayed there all night, peering into the soul of myself in this bird’s form. But soon, I knew it was time and slowly walked my Friend out of the pen, softly gave it lift, and it soared silently into the night sky. What a gift I was given. All my stories about what is real, what is not, what is to be feared, all of them unravel before me. There is nothing, absolutely nothing here to fear. This entry was posted in Awareness, Wonder. Bookmark the permalink.